I have a new corner, or wall, in the workshop. Made a quick bench out at my dad’s shop, using his power tools, mainly because I don’t really have room for anything major. Used two old drawers and built around them. Put the new bench in. Just put the stainless top on it. Hung some pegboard. Nice little home for the dehumidifier and fixtures underneath. Drawers for my sharpening items. I hung the pegboard from the wall with big brackets over the aluminum bar. At some point I can make storage up top, maybe 18″ deep of open rail shelving, for wood or lightweight fixtures, etc… Not much more I can fit in the shop. 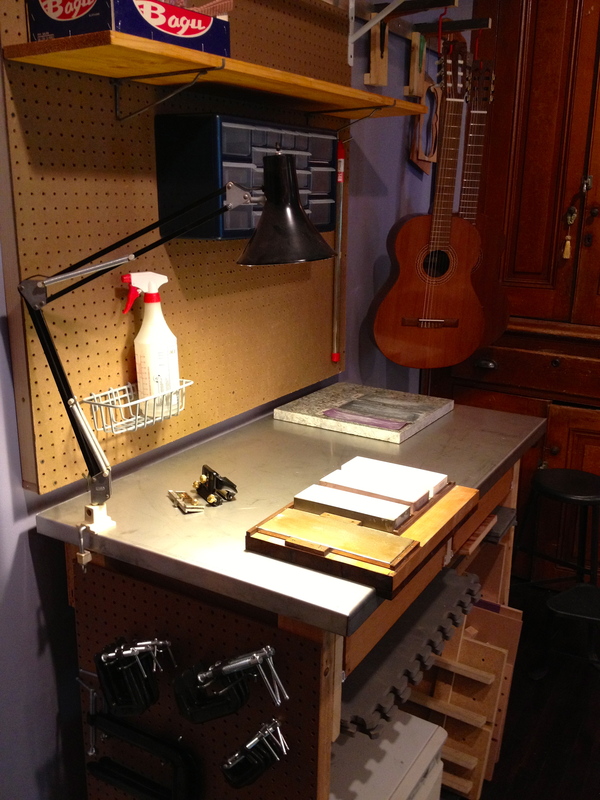 In a world, where one work bench isn’t enough… there lurks another. Across the room, in the shadows…it sits and waits. It’s jaws ready to clamp on whatever passes by… Work Bench II… coming soon… to a shop near…me? Ok, seriously, even though that was awesome and I could have gone on, I finished my other work bench today. Just added some aluminum facing, a shelf underneath and some bracing. Hope to be moving this, the wood bench and a lot of my stuff into my shop sometime next week. Things are moving. Music room has been repainted. New bedroom, repainted. Workshop is next. I’ll post some pics of that stuff once I get things back in. Loving all the changes and new colors so far.